I really, really wanted to make Osso Bucco last night. I woke up thinking about it, and the cold, windy day that greeted me just reinforced my burning need for veal. I flipped through a few of my cookbooks for some ideas on how to make The Best Osso Bucco Ever and set about to gather my ingredients. And then I found out that it is literally impossible to get veal shanks in this city without a week’s notice. I’m not kidding- five phone calls and three store visits, and nothing. Even The Meat House told me that veal shanks would have to be special ordered and it could take days to get them in. Really, The Meat House? However, cooking is about being able to improvise, and the ingredients I had already planned to use for Osso Bucco lent themselves very well to a Plan B: beef stew. All I had to do was grab a different wine and add some thyme and potatoes to my cart – as well as switch from completely unavailable veal shanks to stew beef – and I was set. Even the items I was planning to use for the veal’s gremolata morphed easily into a lemon-garlic marscapone topping for the stew. The recipe below turned out velvety and rich, and while the cook time was lengthy- about 2.5 hours- the prep time was only 30 minutes. 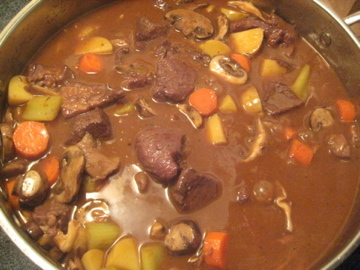 In your face, veal shank-less city of Boston – my Plan B Beef Stew was delicious. Season the beef with salt and pepper- I’m partial to Borsari seasoning salt. It’s easiest to put all of your beef pieces in a plastic bag, add seasoning, and shake to coat. 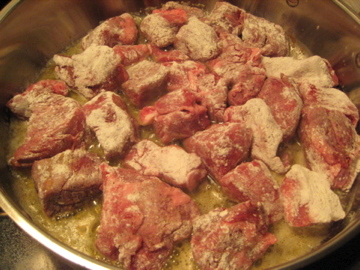 Then dredge beef pieces in flour. Heat a large, deep saucepan with the olive oil and butter (medium heat), then add beef and brown on all sides (takes just 1-2 minutes a side). Remove beef from pan, cover with tin foil. 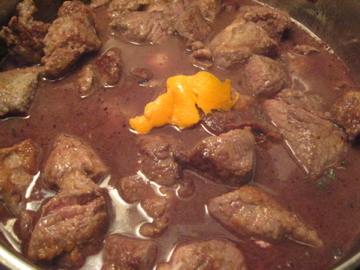 Add wine to the pan and deglaze for several minutes, until wine is simmering. Then add beef broth, thyme, bay leaves, garlic (smash the cloves with the back of your knife and add whole, they will fall apart as they cook), orange zest, and tomato paste. Stir, then add beef back to pan. Simmer uncovered for 15 minutes, then cover and simmer for 2 hours. 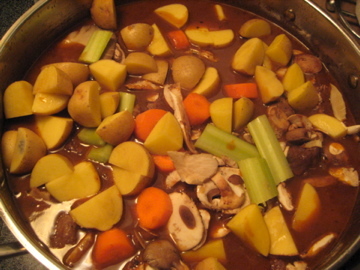 At an hour and 45 minutes, add the celery, carrots, mushrooms, and potatoes. Season with salt and pepper. Remove thyme stems, bay leaves, and any visible chunks of orange rind. 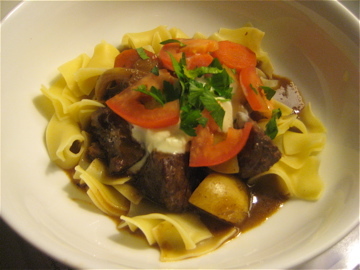 Serve stew over egg noodles and top with Lemon-Garlic Marscapone (recipe below). 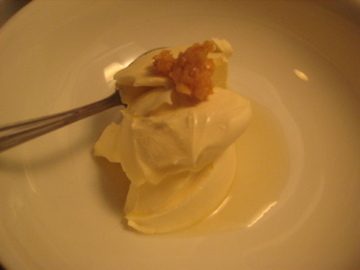 Mix together garlic, lemon juice, marscapone, and salt, let sit for 20 minutes. Add a dollop to your stew bowl, then top with tomatoes and parsley. Voila.